`Pull Up` type seals as the name implies can be pulled tight, thus the length of the loop can be adjusted to any desired length within the overall operating limit. This type of seal is used for a wide range of applications from sealing clinical waste or cash bags to securing fire doors, fire extinguishers, etc. For use with: Cash Bags, Clinical Waste Bags, Vehicle Doors, TIR Cables, Roll Cages, etc. These pull up seals cannot be customised with text or logos. Ideal seal for use with cash or clinical waste bags, etc. 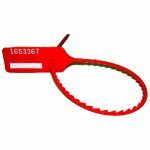 Serrated teeth on the inside of the seal strap make this the ideal seal for use with cash or clinical waste bags, etc. For use with: Bar & Catering Trolleys, Roll Cages, Hatch Covers, etc. The standard seal for use with Fire Extinguishers, these versatile units are also ideal for use with medical boxes, case hasps and in fact anything with a small aperture etc.